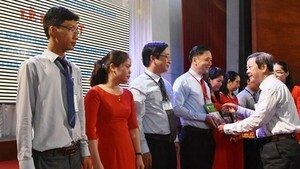 Viet Nam National University Ho Chi Minh City (VNUHCM) and the central province of Ninh Thuan has given 11 scholarships to good students coming from low-income families in Ninh Thuan province. Each scholarship is worth VND9 million ($387.9). Head of student relation ward Dr. Le Thi Thanh Mai said that from 2017 till now, the province and the university has granted 36 scholarships totally worth over VND324 million. Students eligible for the scholarship ought to come from poor families Ninh Thuan province. What is more, they have to take part in at least one activities for the community’s sake as well as their score must be 8 up and 85 marks up in term of their training results. They should stay in the university’ dormitory.